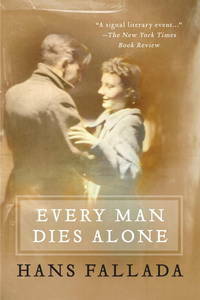 Based on a true story, this never-before-translated masterpiece was overlooked for years after its author--a bestselling writer before World War II who found himself in a Nazi insane asylum at war's end--died just before it was published.In a richly detailed portrait of life in Berlin under the Nazis, it tells the sweeping saga of one working-class couple who decides to take a stand when their only son is killed at the front. 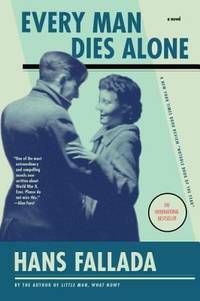 With nothing but their grief and each other against the awesome power of the Third Reich, Otto and Anna Quangel launch a simple, clandestine resistance campaign that soon has an enraged Gestapo on their trail, and a world of terrified neighbors and cynical snitches ready to turn them in.In the end, Every Man Dies Alone is more than an edge-of-your-seat thriller, more than a moving romance, even more than literature of the highest order--it's a deeply stirring story of two people standing up for what's right, and for each other.This edition includes an afterword detailing the gripping history of the book and its author, including excerpts from the Gestapo file on the real-life couple that inspired it. Melville House. PAPERBACK. 1935554042 Item in good condition. Textbooks may not include supplemental items i.e. CDs, access codes etc... . Good. Melville House. Paperback. GOOD. Spine creases, wear to binding and pages from reading. May contain limited notes, underlining or highlighting that does affect the text. Possible ex library copy, thatâll have the markings and stickers associated from the library. Accessories such as CD, codes, toys, may not be included. Melville House Publishing, 2010. Paperback. Acceptable. Disclaimer:A readable copy. All pages are intact, and the cover is intact. Pages can include considerable notes-in pen or highlighter-but the notes cannot obscure the text. At ThriftBooks, our motto is: Read More, Spend Less.Dust jacket quality is not guaranteed. Melville House. Used - Good. All orders guaranteed and ship within 24 hours. Your purchase supports More Than Words, a nonprofit job training program for youth, empowering youth to take charge of their lives by taking charge of a business. Melville House Publishing, 2010. Paperback. Very Good. Disclaimer:A copy that has been read, but remains in excellent condition. Pages are intact and are not marred by notes or highlighting, but may contain a neat previous owner name. The spine remains undamaged. At ThriftBooks, our motto is: Read More, Spend Less.Dust jacket quality is not guaranteed. Melville House. PAPERBACK. 1935554042 Ships quickly. Mild to moderate shelf/reading wear. Orphans Treasure Box sells books to raise money for orphans and vulnerable kids. . Good. Melville House. Used - Good. Shows some signs of wear, and may have some markings on the inside. Melville House, 2010-03-30. Paperback. Very Good. New York: Melville House, 2010. Soft cover. Fine. 8vo - over 7¾ - 9¾" tall. Translated by Michael Hofman. Like new condition; minor shelf wear. Melville House. Used - Good. Good condition. Melville House. PAPERBACK. 1935554042 . Fair. Brooklyn, New York: Melville House, 2009. Paperback--trade. Fine. Octavo, 8 1/4" tall, 539 pages, stiff wraps. A fine, clean, neat soft cover edition with light shelf wear; binding tight, paper white. Melville House. Good. 2010. Paperback. 1935554042 . A Good Read ships from Toronto and Niagara Falls, NY - customers outside of North America please allow two to three weeks for delivery. Creasing to spine. Tanning to text. Edgewear, Creasing to corners. ; 8.1 X 5.5 X 1.7 inches; 544 pages . Brooklyn NY: Melvillehouse , 2009. Wraps have light wear. Pages are clean with no markings in text. . Soft Cover. Good. 8vo - 7¾" - 9¾" Tall. Melville House, 2010-03-30. Paperback. Good. Melville House, 2009. trade paperback with light wear----------------------a true story, tells the tale of a working class couple in Berlin who decide to take a stand against the Nazis. Trade Paperback. Very Good. 8vo - over 7¾" - 9¾" tall. Melville House, March 2010. Trade . Good. Good+ Softcover. Light soiling and shelfwear to covers, except for one bent corner. Spine faintly creased. Yellowing on inside covers. Pages yellowing, but clean and tight in binding. Pictures available upon request. A locally owned, independent book shop since 1984. Brooklyn NY: Melville House , 2010. Book. Illus. by Cover by Kelly Blair. Near Fine. Soft cover. 1st Edition thus. 31700 shelf. Unread. Thick trade paperback, pictorial covers, blue spine. Corner clip (affects quoted reviews) on first page. No names, clean text. Trans: Michael Hofmann. Afterword: Geoff Wilkes. Reading Group guide at back. Solid. .
New York, NY: Melville House, 2010. Book. Very Good. Soft cover. Fourth Printing. Some edge wear to card covers; otherwise a solid, clean copy with no marking or underlining; a very good reading copy..